We simulate short positive and negative streamers in air at standard temperature and pressure. First, double-headed streamers in homogeneous electric fields of 50 kV cm^(&#8722;1) are briefly studied, and then we analyse streamers that emerge from needle electrodes with voltages of 10–20 kV in more detail. The streamer velocity at a given streamer length depends only weakly on the initial ionization seed, except in the case of negative streamers in homogeneous fields. We characterize the streamer evolution by length, velocity, head radius, head charge and maximal field enhancement. We show that the velocity of positive streamers is determined mainly by their radius and in quantitative agreement with recent experimental results both for radius and velocity. The velocity of negative streamers is dominated by electron drift in the enhanced field; in the low local fields of the present simulations, it is little influenced by photo-ionization. Initially it is puzzling that negative streamers can be slower than positive ones under similar conditions, both in experiment and in simulation, as negative streamer fronts always move at least with the electron drift velocity in the local field. We argue that this drift motion broadens the streamer head, decreases the field enhancement and ultimately leads to slower propagation or even extinction of the negative streamer. Luque, A, Ratushna, V, & Ebert, U. M. (2008). 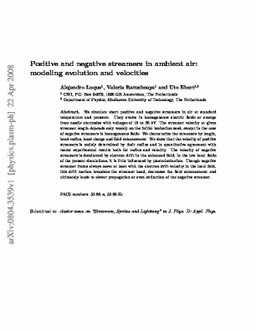 Positive and negative streamers in ambient air: modeling evolution and velocities. Journal of Physics D: Applied Physics, 41.